Person at the picture - Leontiy Spafaryev, Lieutenant General of the Imperial Russian Navy. 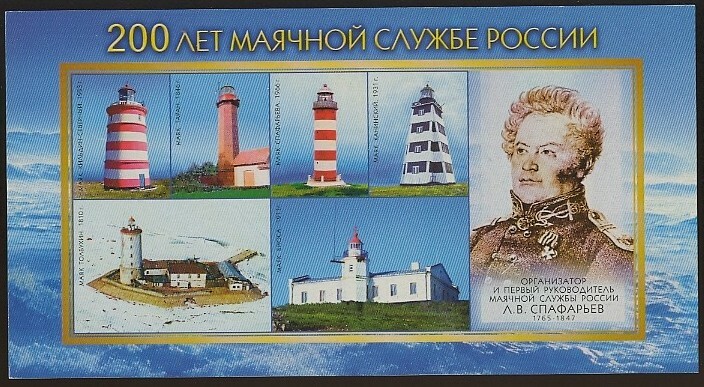 Spafaryev was Director of the Lighthouse Administration and cartographer of the Russian Admiralty. Spafariev was an important contributor to the improvement of navigation along the Russian coasts. The first lighthouses in Russia were built during tsar Peter the Great's drive for reform and modernization at the beginning of the 18th century. However, it was only until the Administration of Lighthouses was created in 1807 that the Russian lighthouse system followed an organized pattern, becoming effective and efficient. This office was established by the Russian Navy and it began under the leadership of Leontiy V. Spafaryev.